Sarah Nader - snader@shawmedia.com Ginger Gauger of Richmond attends Saturday's Women's March Six-Month Anniversary March hosted by the Democratic Party of McHenry County in Woodstock July 22, 2017. 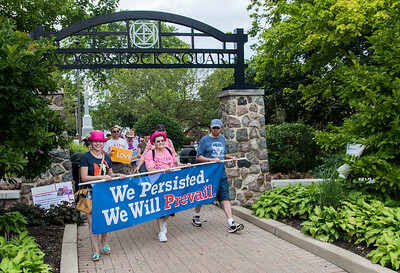 Sarah Nader - snader@shawmedia.com Nicole Scifo (left) of Crystal Lake, Sharon Bakula of Crystal Lake and Bill Nawrocki of Woodstock lead the march at Saturday's Women's March Six-Month Anniversary March hosted by the Democratic Party of McHenry County in Woodstock July 22, 2017. 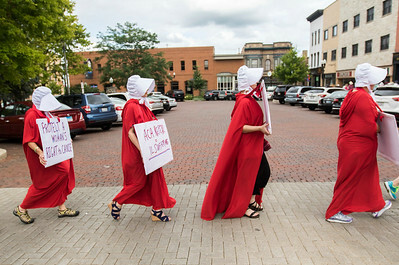 Sarah Nader - snader@shawmedia.com Women dressed as handmaids walk around the Woodstock Square during Saturday's Women's March Six-Month Anniversary March hosted by the Democratic Party of McHenry County July 22, 2017. 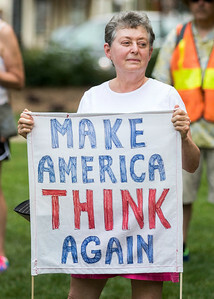 Sarah Nader - snader@shawmedia.com Marian Weiss of Woodstock attends Saturday's Women's March Six-Month Anniversary March hosted by the Democratic Party of McHenry County in Woodstock July 22, 2017. 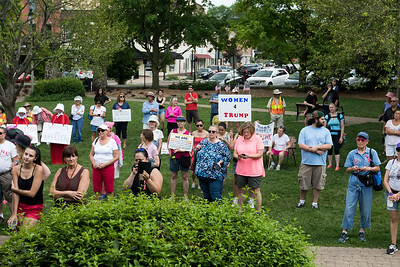 Sarah Nader - snader@shawmedia.com People gather on the Woodstock Square for Saturday's Women's March Six-Month Anniversary March hosted by the Democratic Party of McHenry County July 22, 2017. Sarah Nader - snader@shawmedia.com Lori Kiergaard of Crystal Lake attends Saturday's Women's March Six-Month Anniversary March hosted by the Democratic Party of McHenry County in Woodstock July 22, 2017. 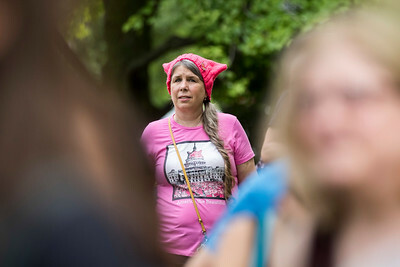 Lori Kiergaard of Crystal Lake attends Saturday's Women's March Six-Month Anniversary March hosted by the Democratic Party of McHenry County in Woodstock July 22, 2017.